You know a lesson is awesome when the Goldfish that the kids get to eat aren’t even their favorite part of the lesson! I had done the Capture Recapture lesson a few years ago and it didn’t go very well, so I abandoned it. However, after seeing a video about the concept (thanks to Alisan’s presentation at NCCTM), I decided to revisit it. I introduced the concept with a question from NRich, then we watched this video on YouTube. It is imperative that you show your students the video. If a picture is worth a 1,000 words, a good video can be worth 1,000 explanations. The video starts with ping pong balls, then moves on to black cabs. I only showed my student the ping pong portion with my students, and then stopped it before he showed the math. I had them calculate the estimated number of balls, and then showed them the result. They were hooked! We moved on to Goldfish. I gave each pair of two their own “pond” full of about 150 yellow Goldfish crackers in a container. I also gave them a small sample of colored Goldfish in a dixie cup. I first had them estimate the number of fish in their pond. I would not let them dump the fish out for the estimation as biologist do not dump the fish out of the pond. We then counted the colored fish (our tagged sample) and replaced Goldfish with the tagged colored Goldfish. I let them eat the fish they replaced. After mixing the tagged fish into their pond, they took a sample and calculated the proportion. To have accurate results, we repeated this 4 total times and then took an average. After they calculated their average, they counted their fish and we compared results. This was the best part! They were shocked to see how close their calculated proportions were to the actual number! 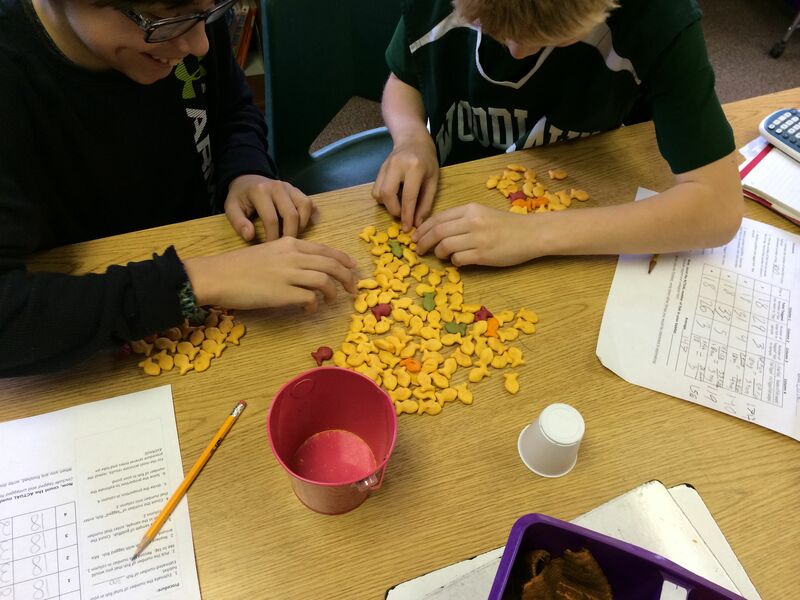 Most groups were only off the actual count by 10 or less Goldfish! I even had groups come within 1, 2, and 3 of the actual number of fish in their pond! Estimate number of Goldfish in pond and record. Count the number of tagged fish, record. Replace Goldfish with tagged fish. Mix tagged fish into pond. Take a new sample. Count total sample and tagged fish, record. Calculate proportion to find estimated number of fish in pond. Count actual fish in the pond and compare. This entry was posted in Activities, lessons taught, Problem Solving by I Speak Math. Bookmark the permalink. Thank you, thank you, thank you! You’ve created the PERFECT lesson, complete with differentiation, multi-disciplinary, and with all materials. Outstanding. thanks for sharing. Once again, you have helped me create an awesome lesson! Yeah! I’m so glad it worked for you! I love that activity and am happy you tried it. I’ve always done this lesson out of our Discovering Algebra book. Can’t wait to take it to the next level with your ideas tomorrow! Thanks!